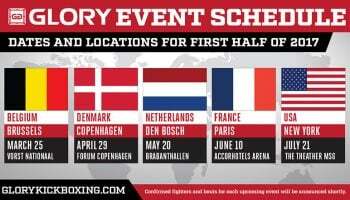 GLORY kickboxing are continuing their big push into the United States with a string of three big shows this fall, starting first Saturday, September 28th in Los Angeles with GLORY 10 Los Angeles, which will feature a one-night Middleweight tournament as well as a few huge fights. The good news is that the event was set to air on CBS Sports Network originally, but it looks like it will be airing on Spike TV instead. In addition to that, the legendary trainer of UFC Lightweight Champion Anthony Pettis, Duke Roufus, will be providing color commentary for Spike TV, most likely alongside longtime GLORY play-by-play man Stephen Quadros. I have a new job!!! I will be the color commentator for @GLORY_WS on @SpikeTV I’m so excited to help showcase Elite #Kickboxing in the USA!